​check the noticeboard for dates! Heswall #4 top the NWCSL (South West) Div 4! A perfect end to a great season saw Heswall Mens #4 lift the NWCSL (South West) Div 4 trophy! The end of the NWCSL season is nearly upon us & it's getting exciting! Heswall 1/4 sit at the top of their divisions get down and show your support. Both can win their division! The only place to watch it live is at the club! It is with deep sadness that I must pass on some terrible news. Norman Watt, one of the Club's longest serving & hardest working members, recently passed away. You may have heard that he had been quite ill for a week or two. However, all of those who knew him fully expected to see him back at the Club sometime soon, such was Norman's tenacious character. Norman's commitment & devotion to the Club was beyond all expectations. Despite having been officially "retired" from Club duties, Norman continued to freely give his time & energy in more ways, behind the scenes, than many Club members will ever know. Norman could be blunt, controversial, cantankerous, often rude yet funny, generous, hard working & always respected. He made an enormous contribution to the Club over many years and will be greatly missed. A card will be left behind the bar this evening should you wish to add your condolences to his wife, Lynn. I shall forward any further details as I have them. A Cornishman who has lived on Dartmoor for 40 years, Geoff is a leading exponent of the rare, Crane Duet concertina. Father of Sean, Sam and Seth Lakeman (who are all internationally renowned folk musicians) Geoff has been described as " A stalwart of the West Country Folk scene and the father of a virtual folk dynasty." Tickets are just £8.00 each from Anne Jones (07780781073), aanddjones@sky.com or, on the door on the night. Join in and have fun, the Friday Folk at HSRC are always great events, please do come along and be part of it! ​Friday Folk Night at HSRC - 18th January 2019 @ 7:30pm! Gerry is one of the Northwest's best singer/songwriters and winner of the 2017 Folk Northwest talent showcase. ​Tickets are just £5.00 each from Anne Jones (07780781073), aanddjones@sky.com or, on the door on the night. ​Join in and have fun, the Friday Folk evenings are proving to be great events at HSRC, please do come along and be part of it! ​Friday Folk Night at HSRC - 30th November 2018 @ 7:30pm! Marie has recorded albums, appeared on TV, radio and many folk festivals all over the UK & Europe. ​Tickets are just £8.00 each from Anne Jones: aanddjones@sky.com or on the door on the night. The club was looking great this morning with the early(ish) light streaming in. The newly framed Tesni Evans t-shirt looks fab in the sun and really zings under the spotlight on an evening. ​Big thanks to HSRC member Claire from Framing Genius for, as usual, a top quality framing job. Friday Folk Night at HSRC - 26th October 2018 @ 7:30pm! After the hugely successful and enjoyable first Folk Night at HSRC, there's another coming hot on the heels..
Local band "Tippin' it Up"
Ken is a guitarist, singer, songwriter and producer from Preston, in England. His music covers the spectrum from blues to rock, and effortlessly takes in folk, jazz, ragtime, ballads and more along the way. Ken was a member of the legendary Albion Band from 1997 until September 2001 when he left in order to spend more time on other projects. In December 2002, he successfully joined forces with Steeleye Span, working with the band for eight years, most recently on their 2009 40th Anniversary Tour, visiting the USA and Australia. During his time with Steeleye he recorded four albums with the band: ‘They Called Her Babylon’, ‘Winter’, ‘Bloody Men’ and ‘Cogs, Wheels and Lovers’. Tickets are just £8.00 each from Anne Jones: aanddjones@sky.com or on the door on the night. ​Join in and have fun, this is going to be the first of many great evenings at HSRC, please do come along and be part of it! Friday Folk Night at HSRC - 28th September 2018 @ 7:30pm! Allan Taylor, one of the UK's best folk singer / songwriters. Tickets are just £8.00 each from Anne Jones: aanddjones@sky.com or on the door on the night. ​The World famous*, super cool and fun HSRC Junior Squash Sessions are back! 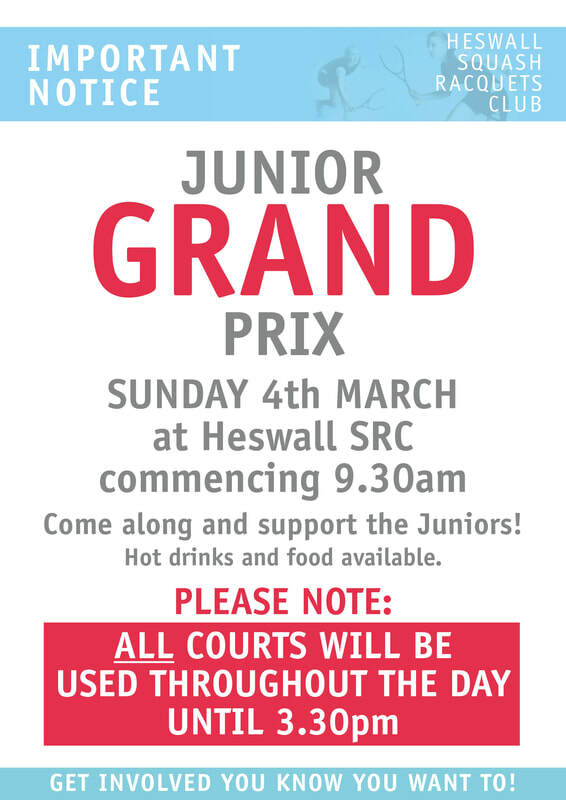 The World famous*, super cool and fun HSRC Junior Squash Sessions are back! 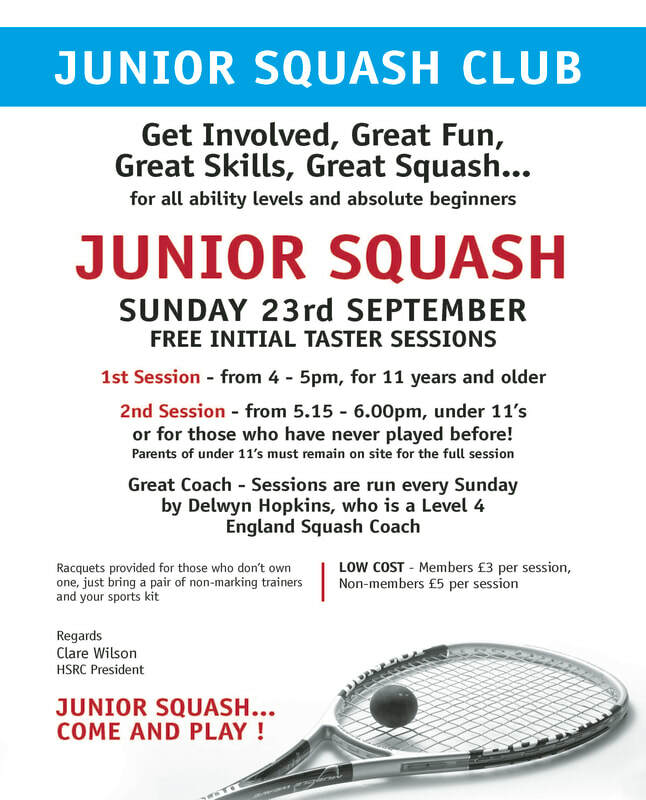 So... if you're a child, a parent of children or your children have young friends who'd like to give squash a go, this is for you! 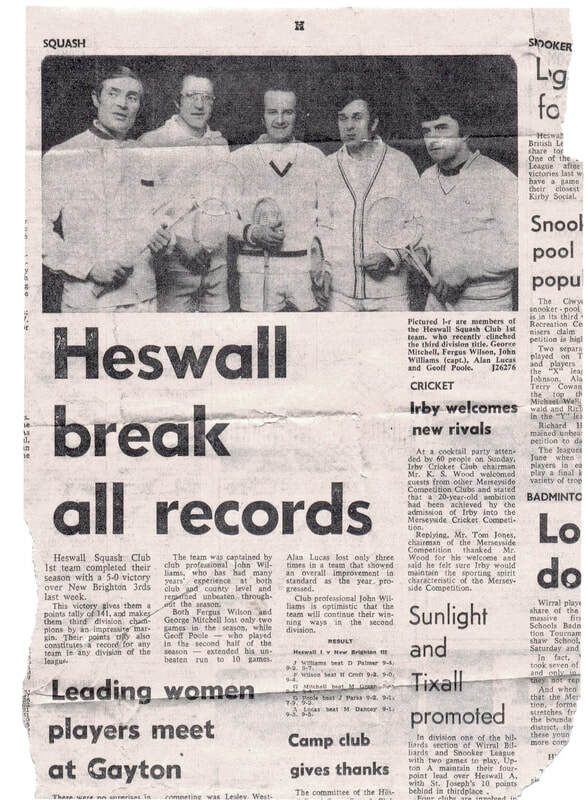 The session will cater for all levels and will be organised by one of Heswall's most experienced players Del Hopkins. Racquets & eye protection will be on loan for the sessions if you / your child don't have any, just bring a pair of clean, non-marking trainers and some suitable sports kit. The taster sessions are free but after that it's £3 per session for junior members and £5 for non-members. Parent's of under 11's must remain with us during the sessions please but all parents are really encouraged to stay, watch and give all the young players help & encouragement. Get along, learn squash, be healthy and have fun! Jools kindly took some pics - click here! 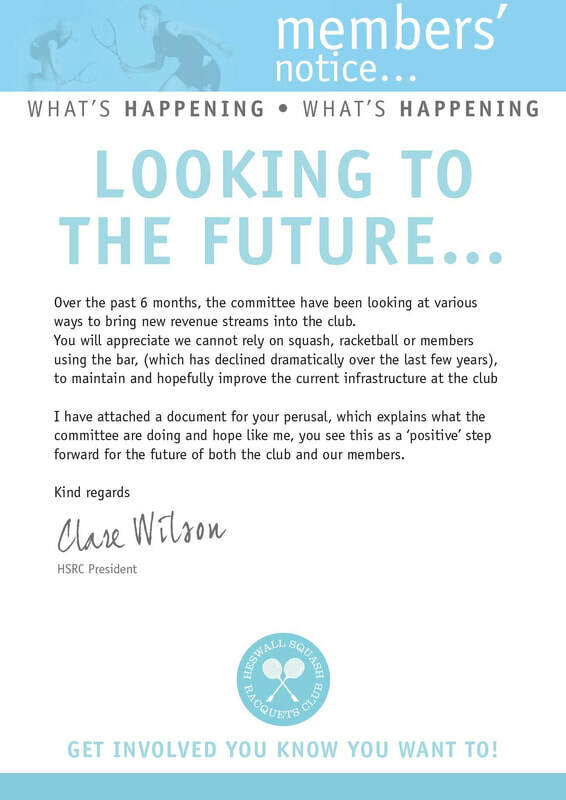 Please do opt to stay "IN" and therefore "ON" the mailing list for all the important (and frivolous) Club announcements. Remember: without you lot, the members, being involved our Club is just a bunch of bricks. *What You Need To Know!!! The new Gym facility on Court One opens 2nd April! Gym facility on Court One - coming soon! Team update and Competition News! With a few matches left before the end of the season. Let’s get behind the boys and girl be the 6th player on a Thursday fill the balcony with support. Onto finals night which is 28 April. For finals night to go ahead those who have entered need to play their matches. All though there are no set dates for the first round etc to be played matches need to be played. Your next opponent is waiting. If you have entered don’t forget its £2 per comp this goes towards the cups being engraved. Please put this in the men’s team tin and text me so I can tick you off the list. Could you get a 6 person team together for a quiz at Heswall Hall on Saturday 20th January? Friends, neighbours, colleagues? ​Heswall Hall Community Trust are holding a Team Quiz Night on Saturday 23rd January from 7.30 pm. It’s an ideal opportunity for a fun night out with family, friends or work colleagues at the start of the New Year. We have a pro quiz master and there’ll be prizes and a bar until 11.30pm ( waiter service to your table once the quiz begins). 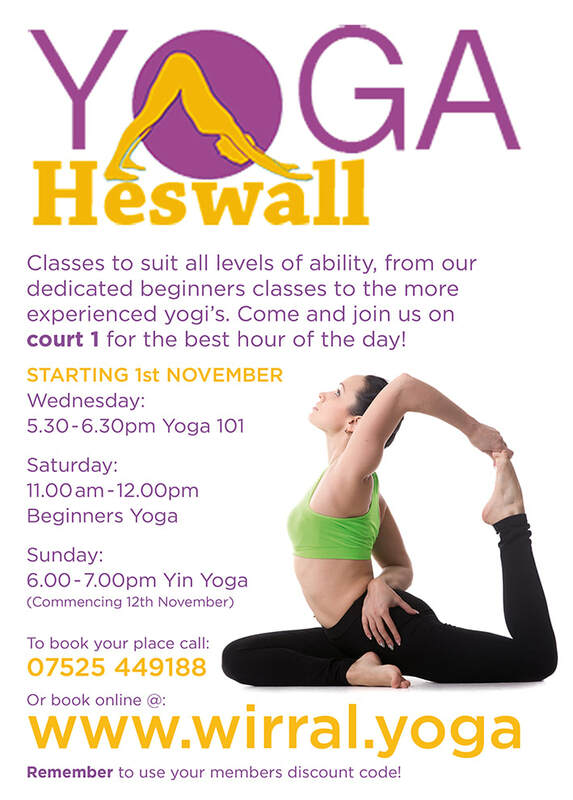 All the proceeds from this event will go to support other Heswall Hall Community Trust events eg. Lunch Club, Tea Dance, Pre -school group, Matinee Cinema Club. Please find below details of the evening and how to book and I’ve also attached a poster. Please remember that you MUST wear indoor sports shoes with NON MARKING soles when on court. The Committee have received several complaints from members. Also, may I remind you NOT to wear shoes on court that you have worn outside of the building. Grit and dirt is carried in on your shoes and this damages the playing surface. Moreover, any loose dirt on the court could cause a player - maybe you! - to lose traction on the surface and suffer serious injury. Please do take note, check your shoes and please, please, please do ask ANY member or visitor (on a team night etc) to leave the court if they are wearing inappropriate footwear.